Whether they’re working at a wedding, birthday party, or corporate event, caterers do more than simply cook food and serve drinks. They also devise menus, shop for ingredients, plate the food, and clean up everyone else’s messes. We spoke to several caterers to get a behind-the-scenes look at what it’s like being responsible for the most important part of any event: the refreshments. 1. THEY DON’T MAKE EVERYTHING FROM SCRATCH. Depending on the size of the event, caterers may be responsible for feeding and serving anywhere from 5 to 5000 people. For big events, caterers simply don’t have the time to make everything from scratch. So don’t be surprised if you see a caterer using store-bought items such as sauces, tapenades, or cookies. Caterers may also use other kitchen shortcuts such as powdered (rather than whole) eggs—a hack that can save time, hassle, and money. 2. THEY’RE PROBABLY TYPE A PERSONALITIES. Wedding caterer Jerry Baker tells Entrepreneur that catering is a stressful job that requires long hours and difficult work. “There are very few businesses that have as much pressure to perform on time as a wedding caterer. You have to be very type A to succeed at a high level,” he says. Baker also emphasizes that caterers need to be flexible and willing to do any task that’s required of them. “Sometimes I'm the fastest prep cook we have and I'm chopping vegetables, and sometimes I'm hauling trash at 2 a.m. after 15 hours on my feet in order to help us get out [of the venue],” he says. 3. THEY’RE VERY AWARE OF TEMPERATURES. Temperature is always a concern for caterers, whether they’re using ice to keep food chilled before serving it or ensuring that entrees are served hot. To control the temperature of foods, most caterers travel to events with bags of ice, multiple coolers, and portable burners. And to come up with a suitable menu for an event, caterers must carefully consider whether the event will be outdoors or indoors and plan accordingly to avoid food contamination (think mayonnaise that sits outside in the sun for hours). 4. THEY NEED TO BE GOOD AT MATH. If a party has a guest list of 75 people, how many bread rolls, cheese cubes, forks, napkins, and ice cubes should a caterer bring? Having too few items can be disastrous, but having too many can be a waste of money. As New Jersey-based caterer Cheri Scolari explains to Good Housekeeping, most people overestimate how much food their guests will eat. But caterers follow a few time-tested rules of thumb for getting the amount of food and drink just right. “We usually say that a half pan of salads or entrees can serve 10 to 12 people,” Scolari says. As for drinks, most caterers plan to serve roughly one drink per person per hour. 5. OFFSITE WORK CAN BE A BIG CHALLENGE. Tanya Gurrieri of Salthouse Catering in Charleston, South Carolina tells mental_floss that being an off-premise caterer (as opposed to one who works for a specific venue) is particularly challenging, because of the ever-changing environments in which they work. “We might be smiling on the outside and crying on the inside,” she says. For each new event, caterers must set up kitchens in unfamiliar spaces and work within the venue's power, lighting, and equipment constraints. And because both client and caterer have high expectations for the food and service, caterers can face tremendous pressure to pull off every event smoothly. “Folks don’t care that they’re sitting under a tent in the middle of a field—they expect their dinner to be served promptly and perfectly,” Gurrieri says. 6. FOOD AND DRINKS ARE JUST THE BEGINNING. Caterers can go beyond cooking and serving food. Some provide clients with plates, bowls, cups, utensils, napkins, tablecloths, and decorations, as well as rented tents, canopies, and chairs. According to Jasmine Williams of farm-to-table catering business A Fork Full of Earth, some caterers are food-focused while others are more all-encompassing. “We are a ‘food-focused' catering company, so we do mostly food, and then refer our clients out to our preferred network of subcontractors for their other needs,” she explains to mental_floss. 7. THEY’RE PREPARED FOR THINGS TO GO WRONG. Although caterers generally know ahead of time what food they’ll be cooking and how many people they’ll be feeding, they’re always prepared for the unexpected. Whether a batch of biscuits gets burned in the oven, a glass pan shatters, or several guests are unexpectedly gluten-free, caterers can deal with surprises. “Nothing replaces having years of experience. Once you’ve seen things go wrong, you plan ahead to protect against it happening again,” Williams says. "The best thing you can do is have a mindful policy in place to correct the issue after it occurs." 8. THEY MAY USE YOU AS A TASTE TESTER. If you insist on having yuca root pancakes or cotton candy Rice Krispies treats at your event, don’t expect your caterer to be in familiar territory. While most caterers are able to apply their culinary knowledge and skills to make a suitable version of any dish you request, they may not have any experience making more unusual recipes. That means your event might be the first time they serve a particular dish—but that shouldn’t be cause for concern if you trust your caterer’s experience and knowledge. Just be aware that you might be something of a guinea pig. 9. FOODBORNE ILLNESSES MAKE THEIR BUSINESS RISKY. Due to food safety laws and the risks inherent in running a kitchen and serving food to strangers, catering isn’t a profession that most cooks enter on a whim. “Catering is in a high-risk category because you’re making something that’s being consumed by individuals and handled by multiple people,” Michelle Bomberger, an attorney who represents caterers, tells the National Federation of Independent Business. 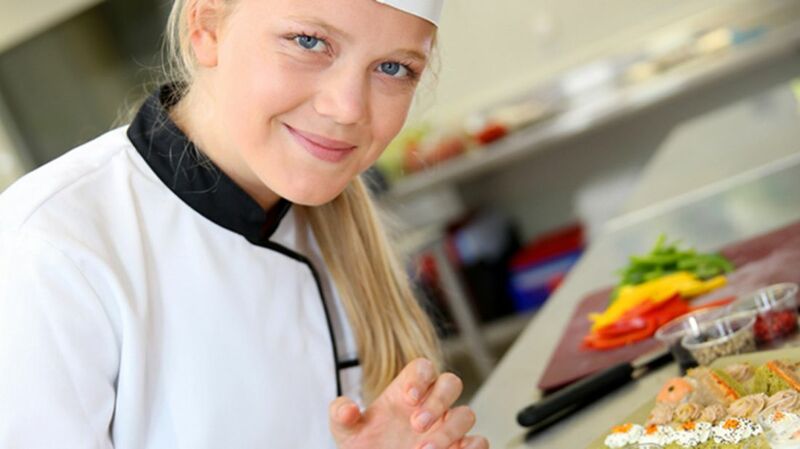 Although professional caterers needn’t necessarily attend culinary school, they must adhere to health and building codes, get a business license, pass local health department inspections, and buy insurance to cover food poisoning and kitchen fires. 10. THEY TRAVEL WITH GARBAGE BAGS GALORE. While it’s not as glamorous as plating caviar-topped salmon or serving tuna tartare appetizers, garbage is an essential component of catering. Depending on the venue, some caterers may be off the hook for cleaning up the trash, but most caterers who work on-site at a home or event space need to deal with the dumpster. For every ten people they serve, caterers plan to bring one large garbage bag. And to save time during an event, they line a few bags in each garbage can before the party starts. 11. FLUCTUATING FOOD PRICES CAN AFFECT THEM DEEPLY. The USDA Economic Research Service expects grocery prices to rise between 0.5 and 1.5% in 2017. Stormy weather, droughts, and diseased crops are responsible for the higher prices of foods, particularly coconuts, olive oil, vanilla, and oranges. While a roughly 1% increase might not sound like much, fluctuating food prices can greatly impact a caterer’s bottom line, forcing them to raise the prices they charge or opt for less expensive ingredients. Zapher Dajani of The Abbey Catering says that he looks at food prices over the past three years to anticipate future inflation. “We also try to limit our proteins to enjoy huge economies of scale pricing discounts,” he tells mental_floss. 12. THEY LOVE THE ART OF FOOD AND SERVICE.